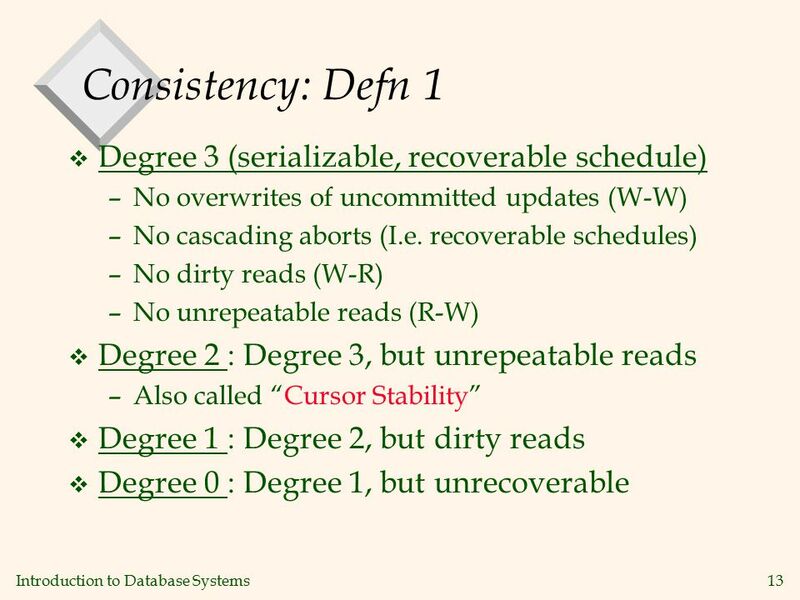 2 Introduction to Database Systems2 Why Have Concurrent Processes? v Better transaction throughput, response time v Done via better utilization of resources: –while one processes is doing a disk read, another can be using the CPU or reading another disk  DANGER!  DANGER! Concurrency could lead to incorrectness! 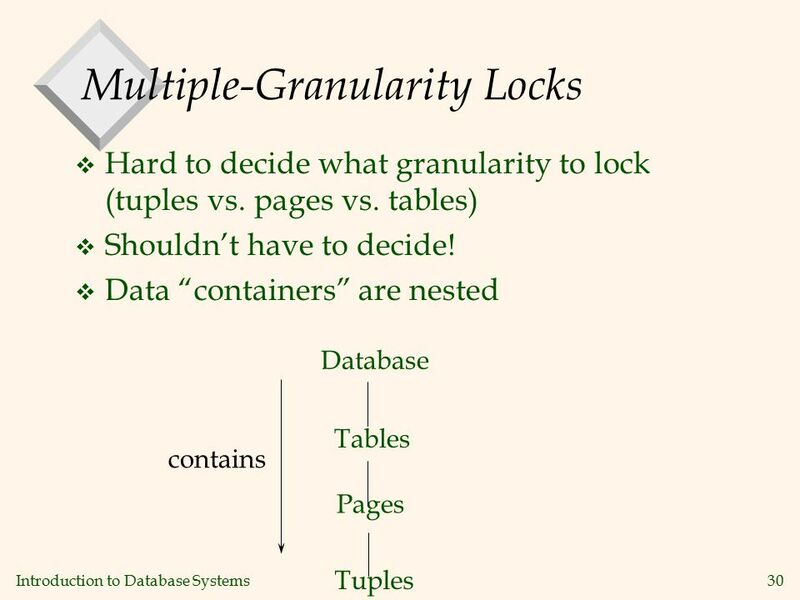 –Must carefully manage concurrent data access –There’s (much!) more here than the usual OS tricks! 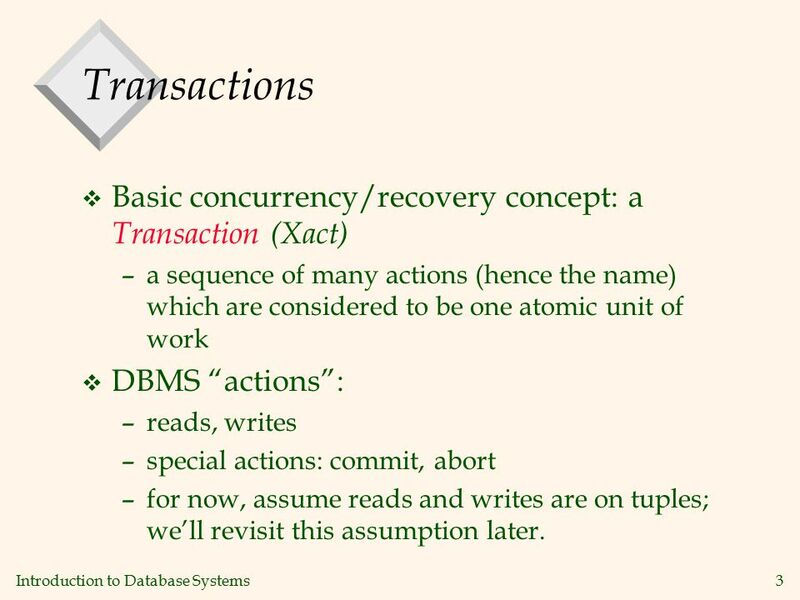 3 Introduction to Database Systems3 Transactions v Basic concurrency/recovery concept: a Transaction (Xact) –a sequence of many actions (hence the name) which are considered to be one atomic unit of work v DBMS “actions”: –reads, writes –special actions: commit, abort –for now, assume reads and writes are on tuples; we’ll revisit this assumption later. 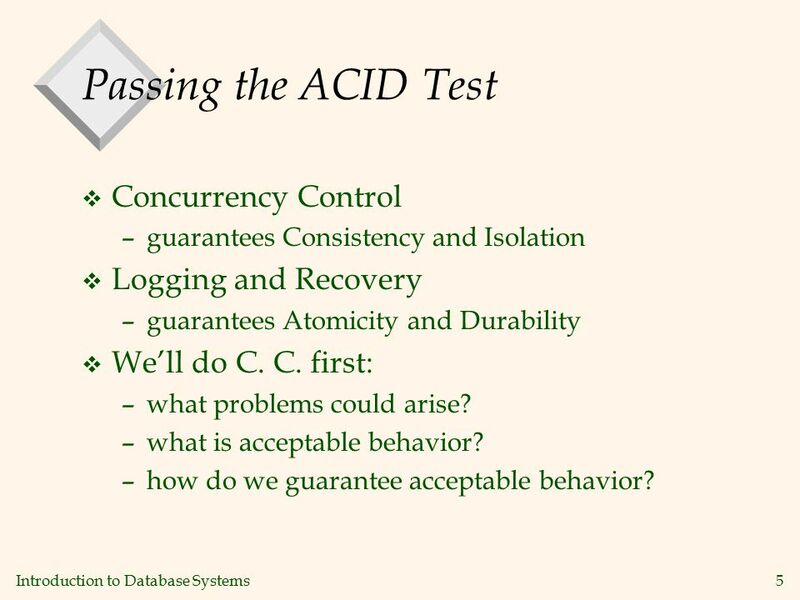 5 Introduction to Database Systems5 Passing the ACID Test v Concurrency Control –guarantees Consistency and Isolation v Logging and Recovery –guarantees Atomicity and Durability v We’ll do C. C. first: –what problems could arise? –what is acceptable behavior? –how do we guarantee acceptable behavior? 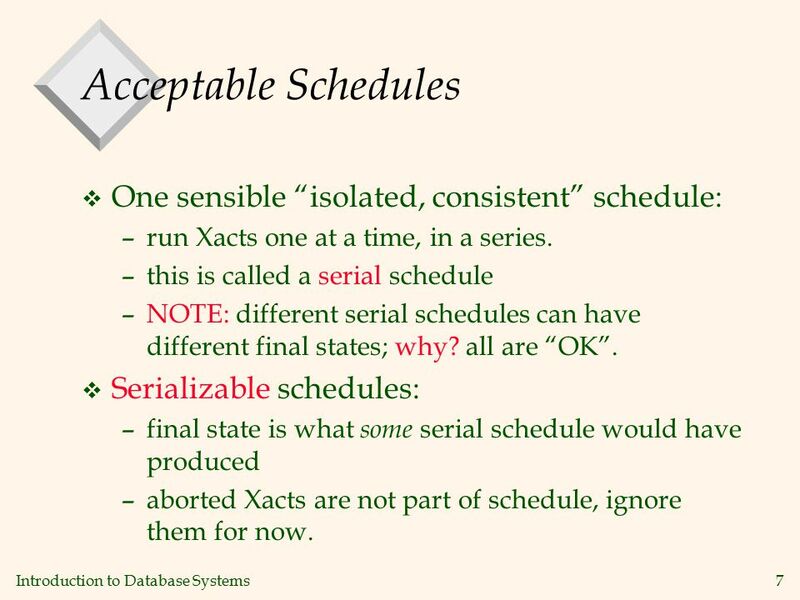 7 Introduction to Database Systems7 Acceptable Schedules v One sensible “isolated, consistent” schedule: –run Xacts one at a time, in a series. –this is called a serial schedule –NOTE: different serial schedules can have different final states; why? all are “OK”. 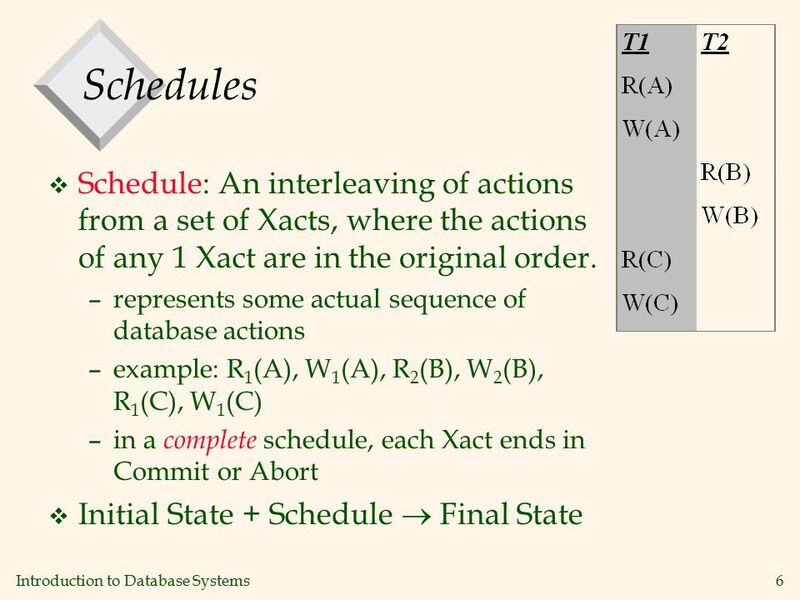 v Serializable schedules: –final state is what some serial schedule would have produced –aborted Xacts are not part of schedule, ignore them for now. 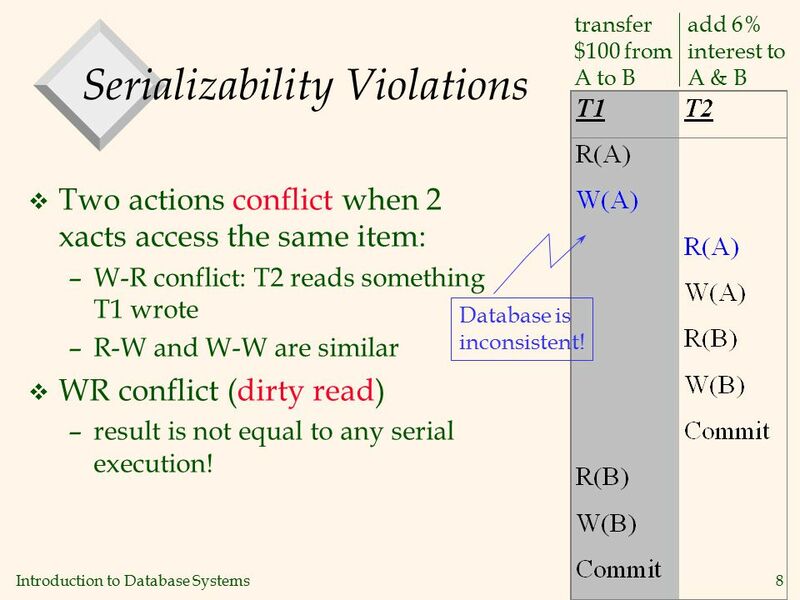 8 Introduction to Database Systems8 Serializability Violations v Two actions conflict when 2 xacts access the same item: –W-R conflict: T2 reads something T1 wrote –R-W and W-W are similar v WR conflict (dirty read) –result is not equal to any serial execution! transfer $100 from A to B add 6% interest to A & B Database is inconsistent! 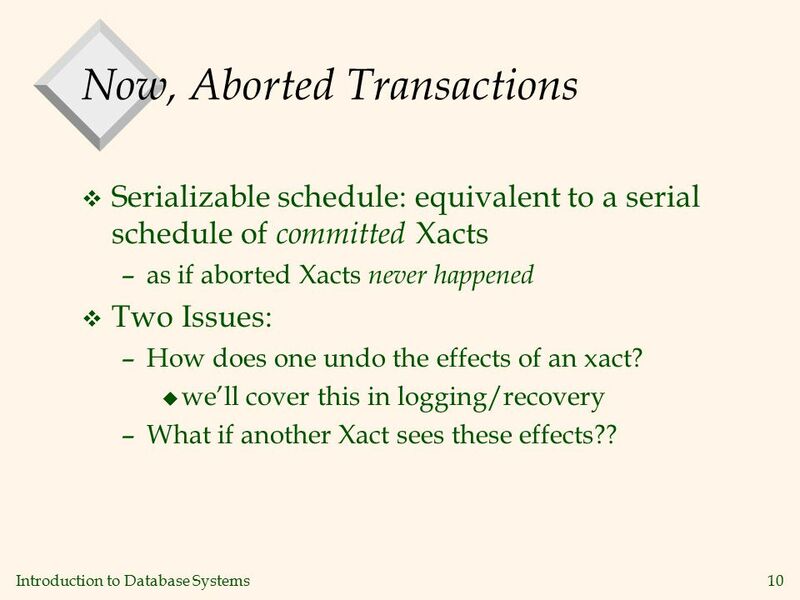 10 Introduction to Database Systems10 Now, Aborted Transactions v Serializable schedule: equivalent to a serial schedule of committed Xacts –as if aborted Xacts never happened v Two Issues: –How does one undo the effects of an xact? u we’ll cover this in logging/recovery –What if another Xact sees these effects?? 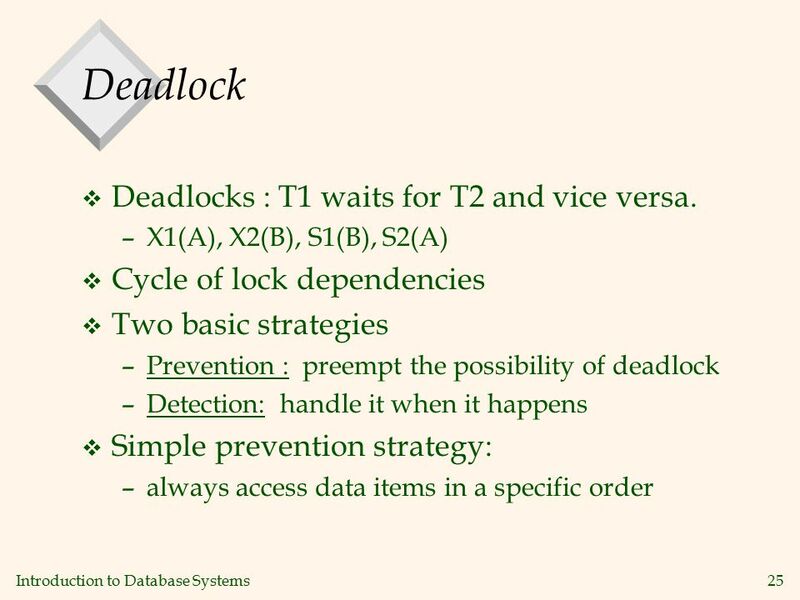 11 Introduction to Database Systems11 Cascading Aborts v Abort of T1 requires abort of T2! 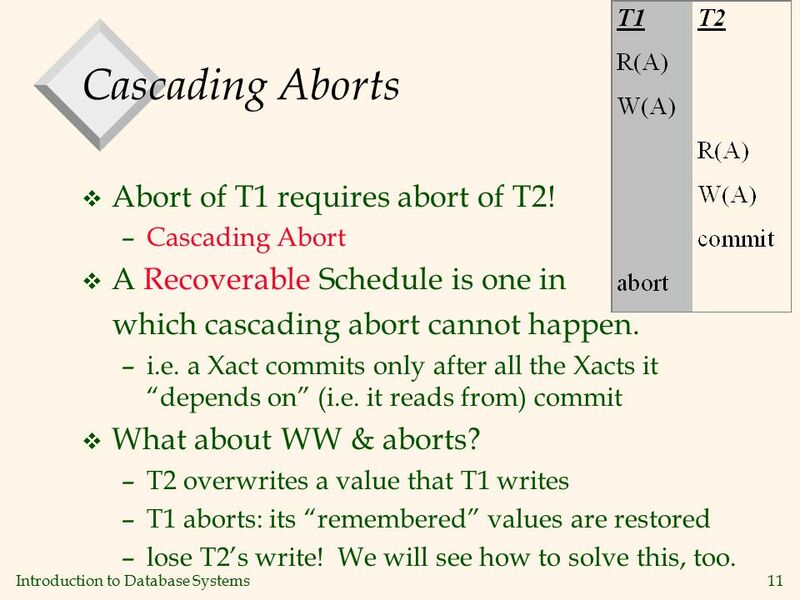 –Cascading Abort v A Recoverable Schedule is one in which cascading abort cannot happen. –i.e. 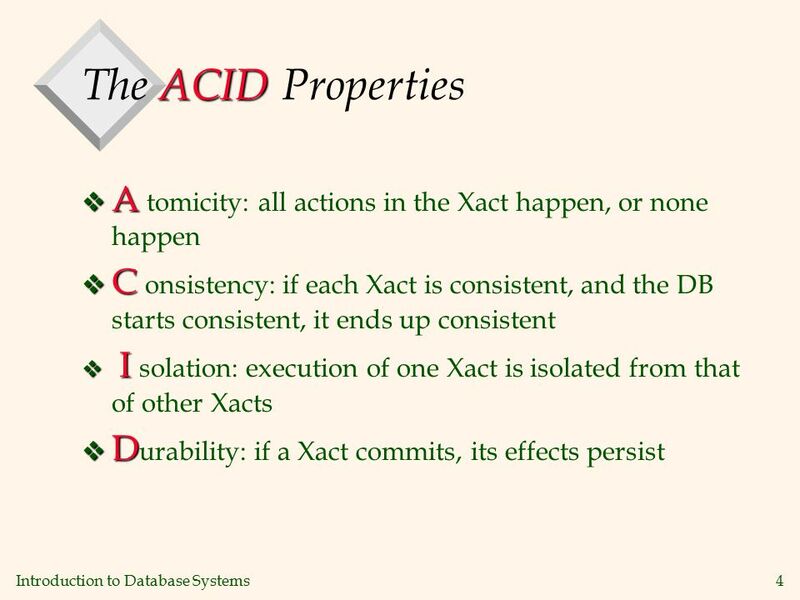 a Xact commits only after all the Xacts it “depends on” (i.e. it reads from) commit v What about WW & aborts? 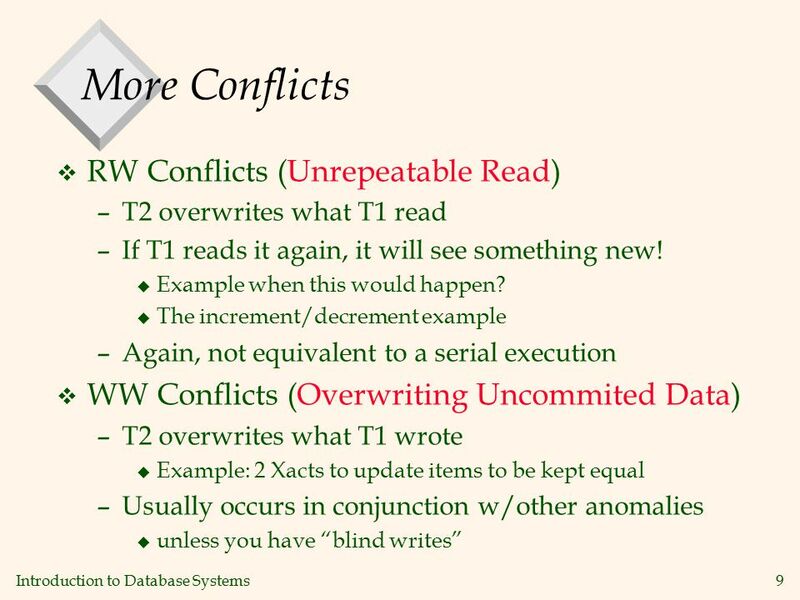 –T2 overwrites a value that T1 writes –T1 aborts: its “remembered” values are restored –lose T2’s write! 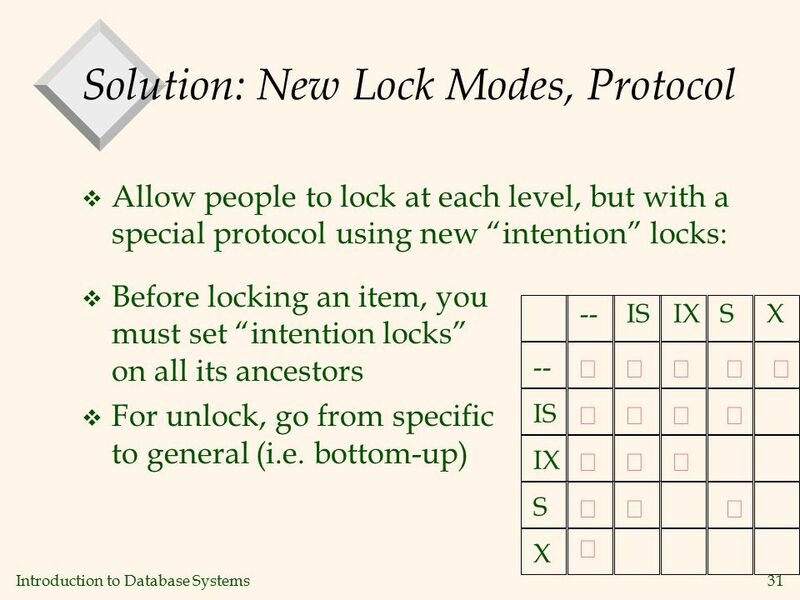 We will see how to solve this, too. 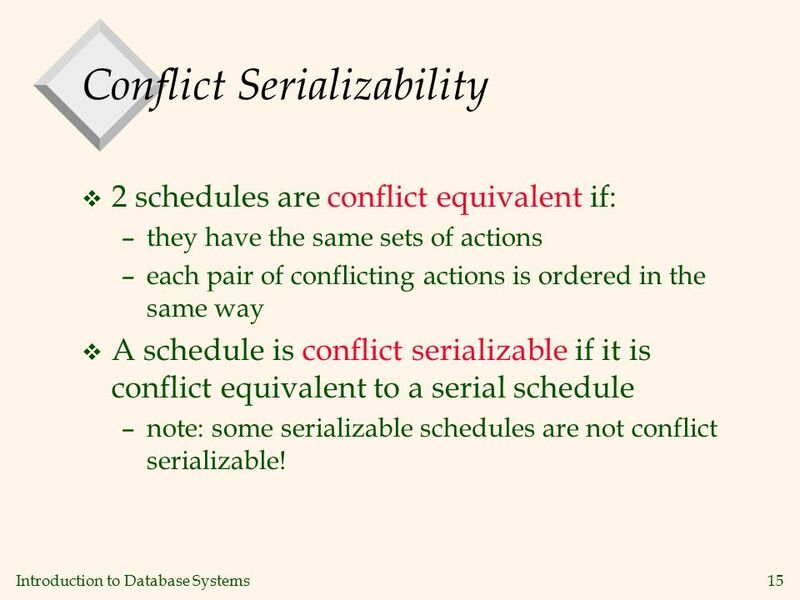 15 Introduction to Database Systems15 Conflict Serializability v 2 schedules are conflict equivalent if: –they have the same sets of actions –each pair of conflicting actions is ordered in the same way v A schedule is conflict serializable if it is conflict equivalent to a serial schedule –note: some serializable schedules are not conflict serializable! 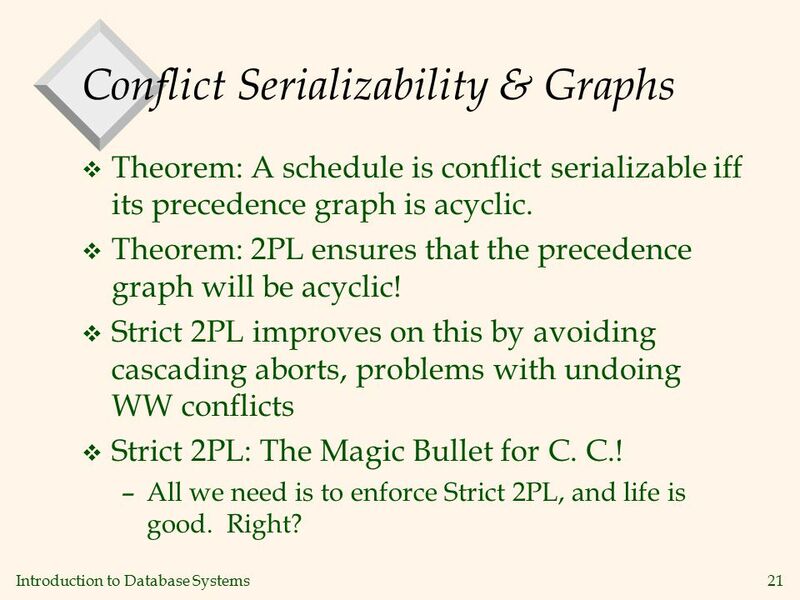 21 Introduction to Database Systems21 Conflict Serializability & Graphs v Theorem: A schedule is conflict serializable iff its precedence graph is acyclic. 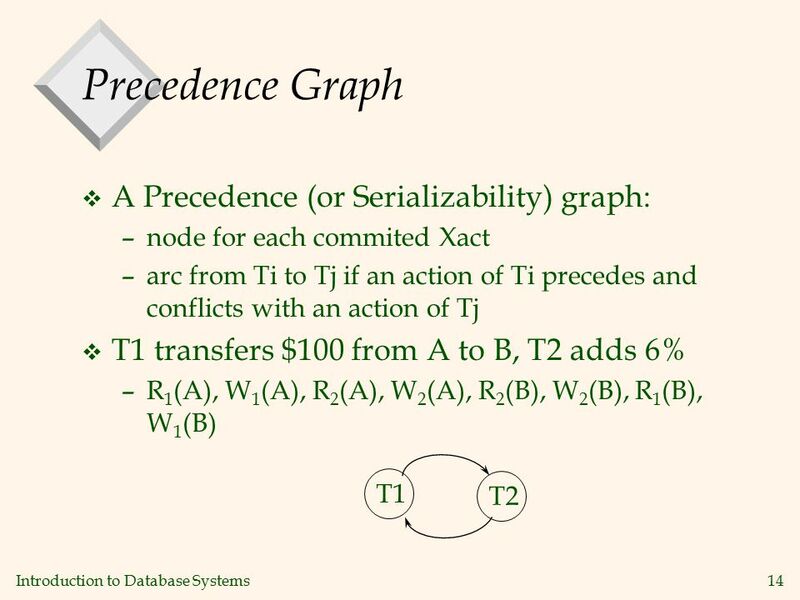 v Theorem: 2PL ensures that the precedence graph will be acyclic! 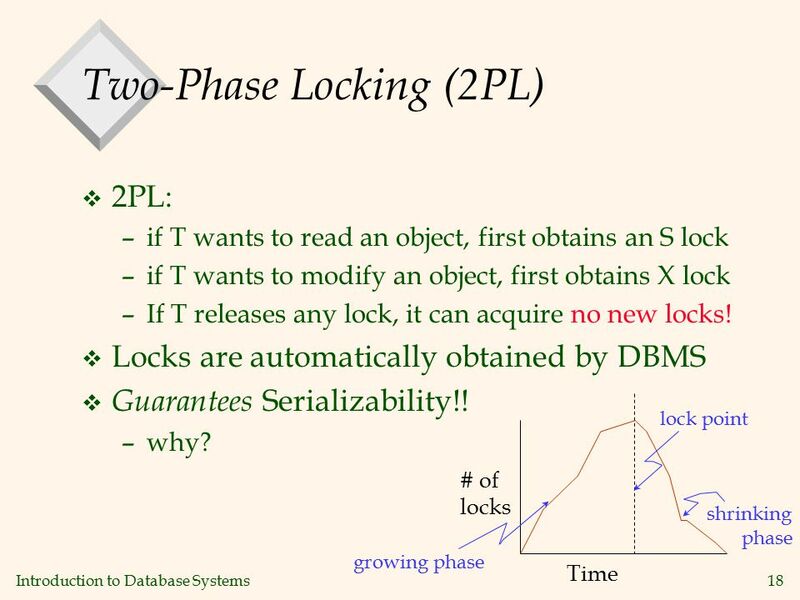 v Strict 2PL improves on this by avoiding cascading aborts, problems with undoing WW conflicts v Strict 2PL: The Magic Bullet for C. C.! –All we need is to enforce Strict 2PL, and life is good. Right? 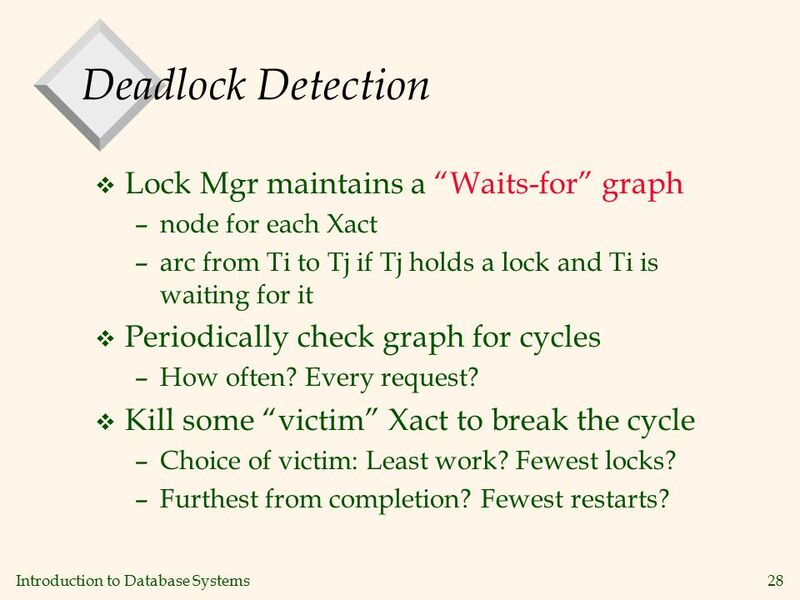 28 Introduction to Database Systems28 Deadlock Detection v Lock Mgr maintains a “Waits-for” graph –node for each Xact –arc from Ti to Tj if Tj holds a lock and Ti is waiting for it v Periodically check graph for cycles –How often? Every request? v Kill some “victim” Xact to break the cycle –Choice of victim: Least work? Fewest locks? –Furthest from completion? Fewest restarts? 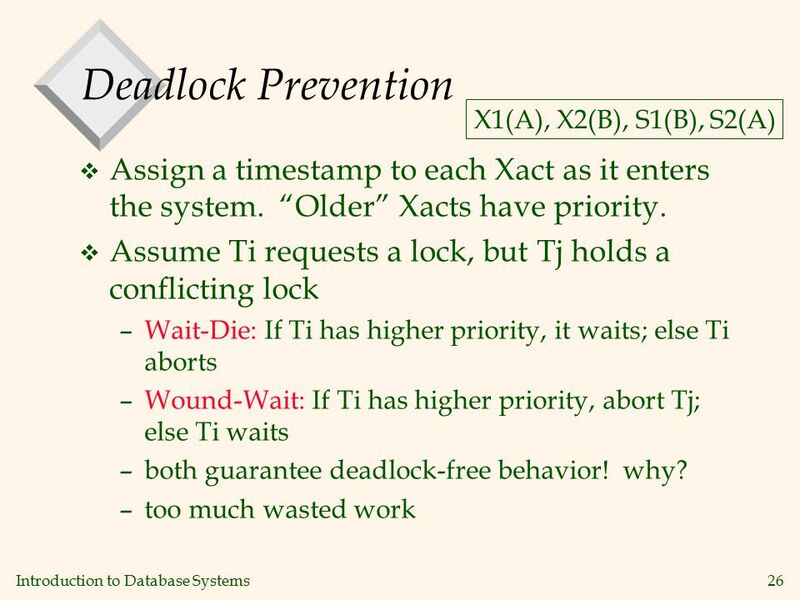 29 Introduction to Database Systems29 Prevention vs. 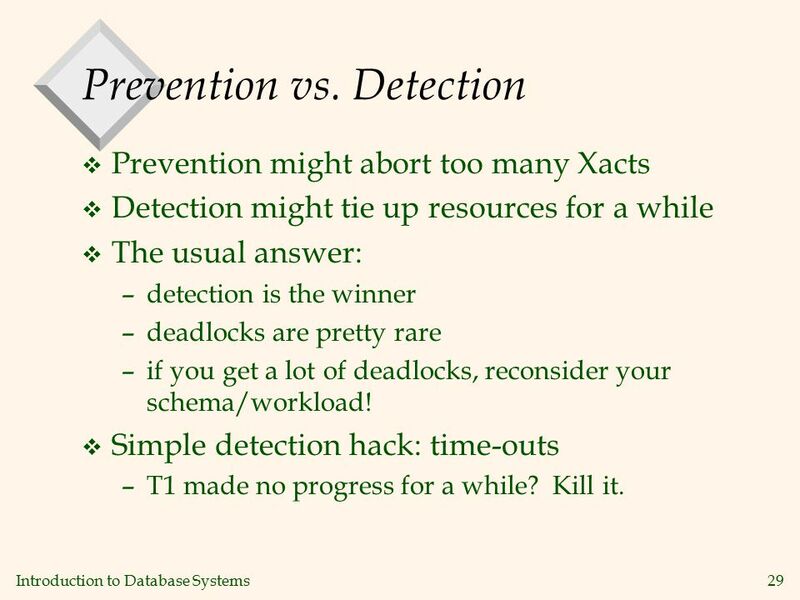 Detection v Prevention might abort too many Xacts v Detection might tie up resources for a while v The usual answer: –detection is the winner –deadlocks are pretty rare –if you get a lot of deadlocks, reconsider your schema/workload! v Simple detection hack: time-outs –T1 made no progress for a while? Kill it. 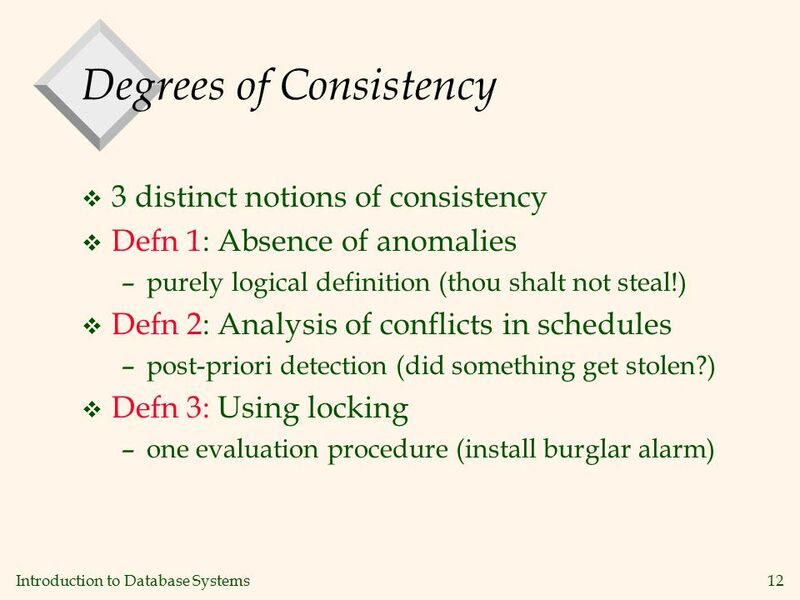 33 Introduction to Database Systems33 Summary, cont. 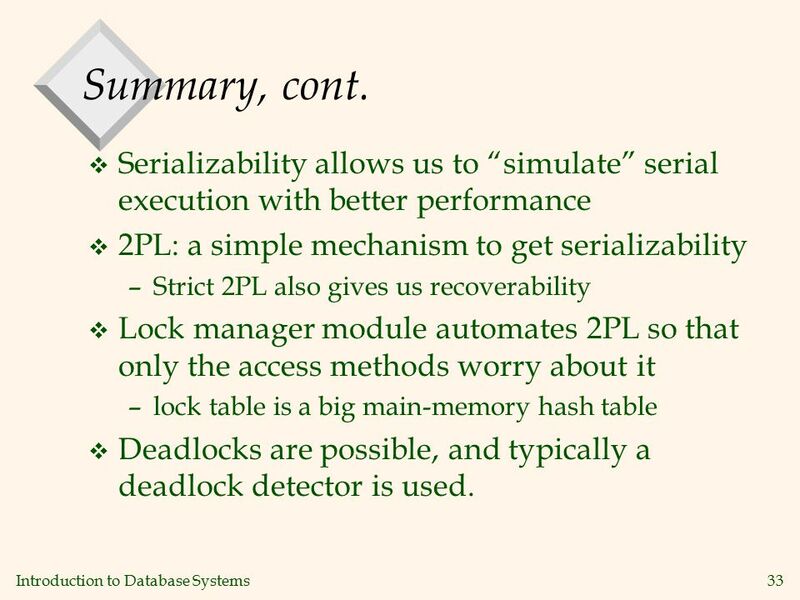 v Serializability allows us to “simulate” serial execution with better performance v 2PL: a simple mechanism to get serializability –Strict 2PL also gives us recoverability v Lock manager module automates 2PL so that only the access methods worry about it –lock table is a big main-memory hash table v Deadlocks are possible, and typically a deadlock detector is used. 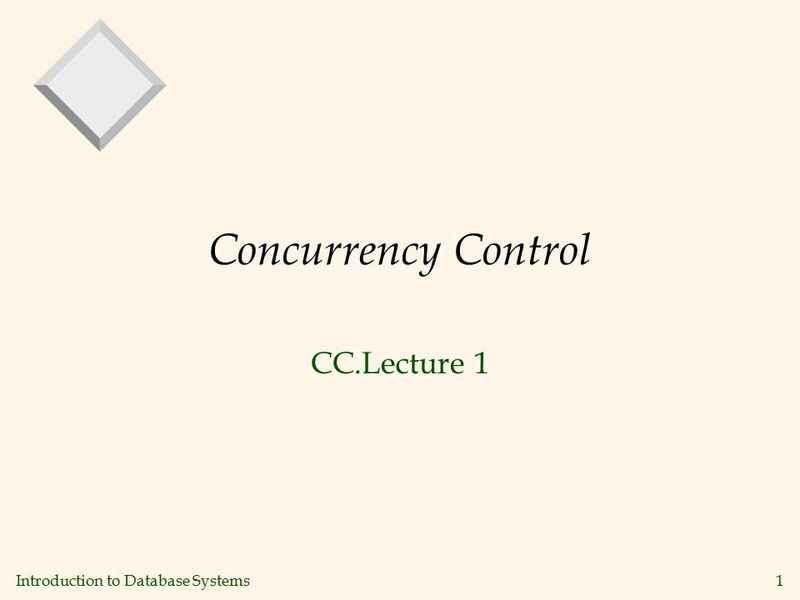 Download ppt "Introduction to Database Systems1 Concurrency Control CC.Lecture 1." 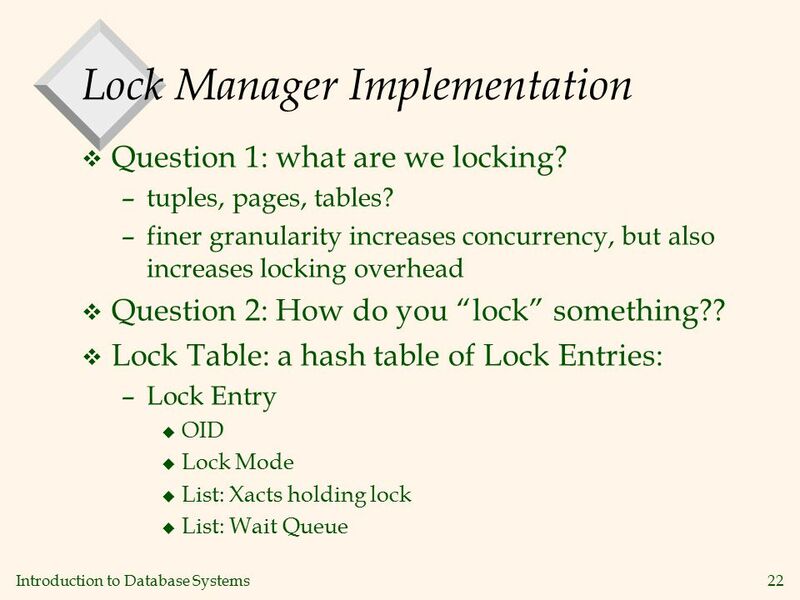 Database Management Systems 3ed, R. Ramakrishnan and J. Gehrke1 Transaction Management Overview Chapter 16. What is Concurrent Process (CP)? Multiple users access databases and use computer systems Multiple users access databases and use computer systems simultaneously. TRANSACTION PROCESSING SYSTEM ROHIT KHOKHER. 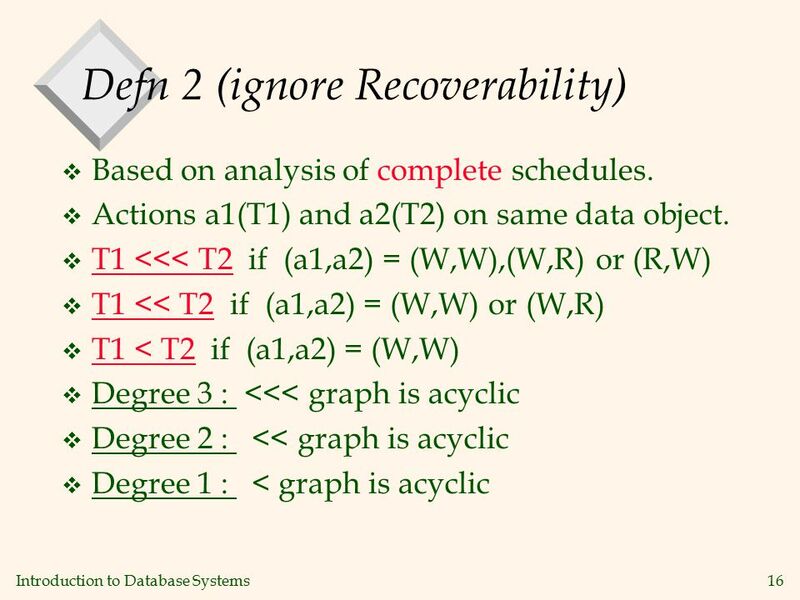 TRANSACTION RECOVERY TRANSACTION RECOVERY TRANSACTION STATES SERIALIZABILITY CONFLICT SERIALIZABILITY VIEW. Principles of Transaction Management. Outline Transaction concepts & protocols Performance impact of concurrency control Performance tuning. 1 Part V: Transactions, Concurrency control, Scheduling, and Recovery. Transactions (Chapter ). What is it? 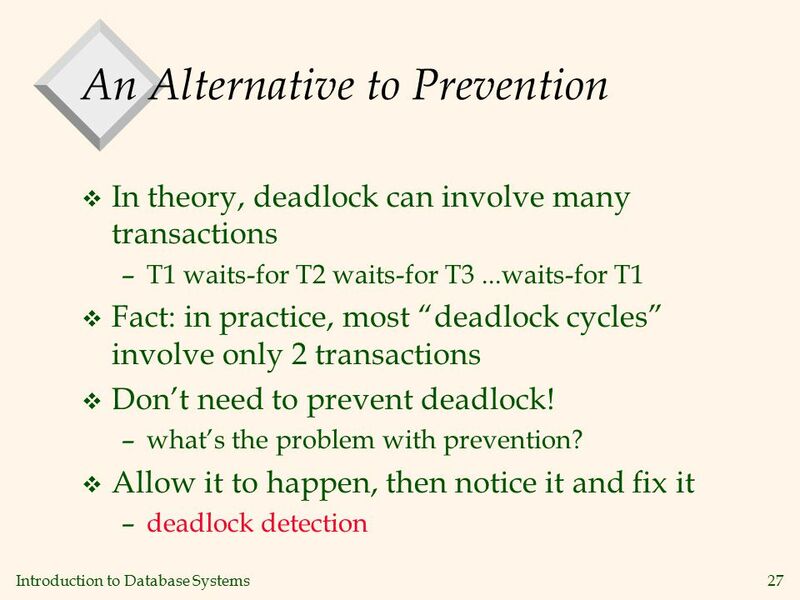 Transaction - a logical unit of database processing Motivation - want consistent change of state in data Transactions. 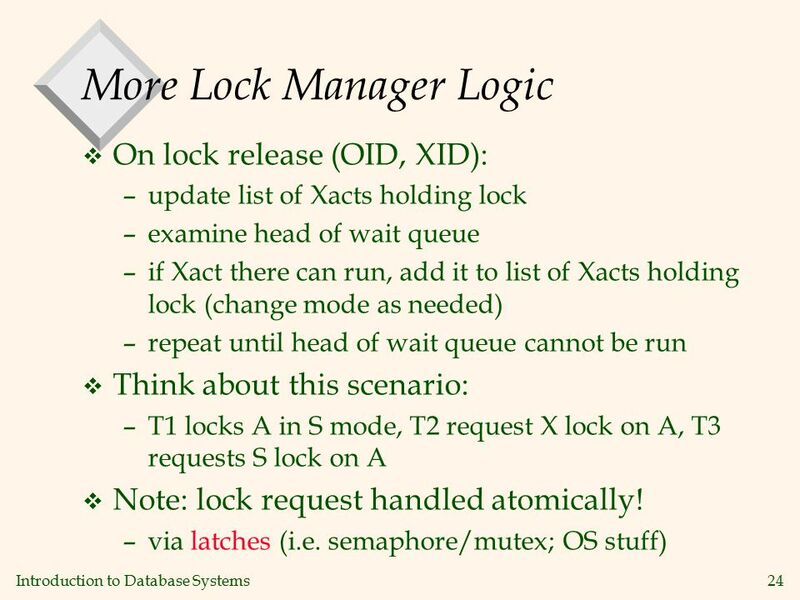 1 Transaction Management Overview Chapter Transactions  Concurrent execution of user programs is essential for good DBMS performance.  Because. Transaction Management Overview. 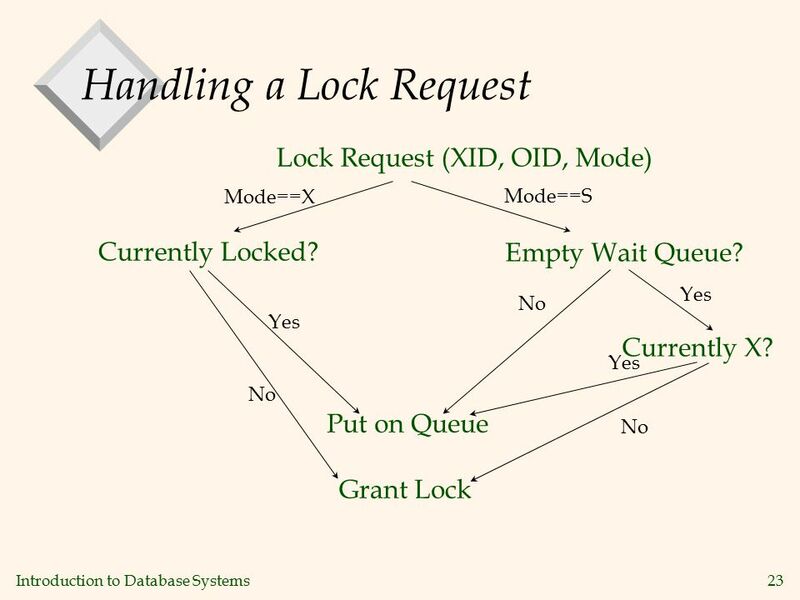 Transactions Concurrent execution of user programs is essential for good DBMS performance. –Because disk accesses are. ICOM 6005 – Database Management Systems Design Dr. Manuel Rodríguez-Martínez Electrical and Computer Engineering Department Lecture 16 – Intro. to Transactions. Transaction Management Overview R & G Chapter 16 There are three side effects of acid. Enhanced long term memory, decreased short term memory, and I forget. Concurrency Control and Recovery In real life: users access the database concurrently, and systems crash. Concurrent access to the database also improves. 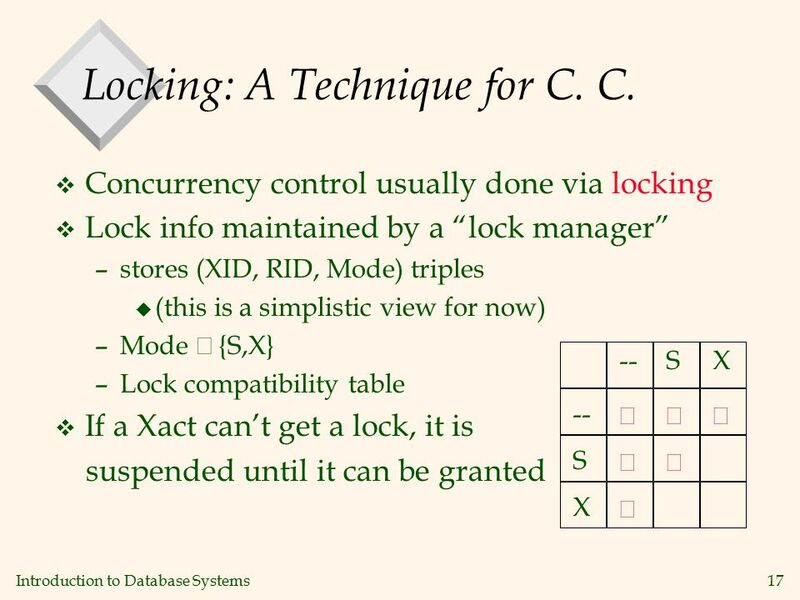 Concurrency control using transactions 1Transactions. 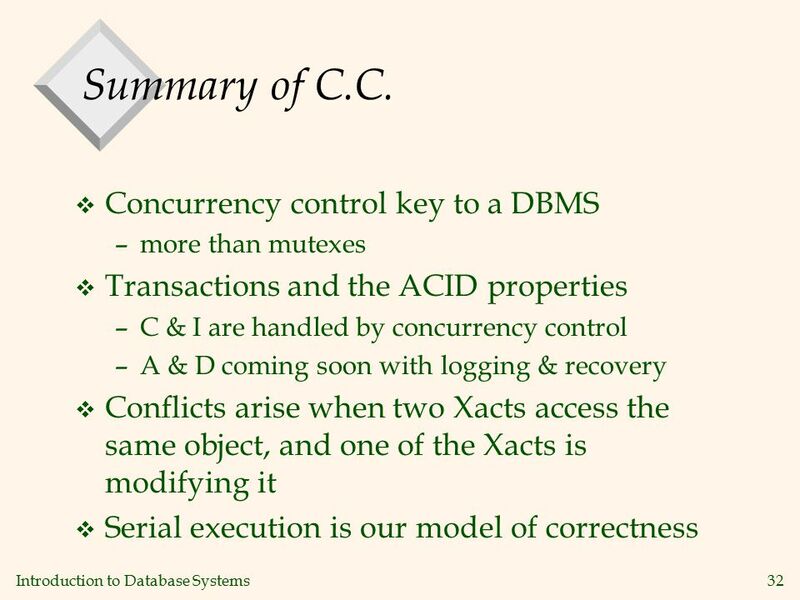 1 Concurrency Control and Recovery Module 6, Lecture 1. 1 Transaction Management Overview Yanlei Diao UMass Amherst March 15, 2007 Slides Courtesy of R. Ramakrishnan and J. Gehrke.